The King James Version, or Authorized Version, of the Bible remains a favorite Bible for many believers and non-believers alike. The believer reads it as God’s Word and the standard for life, and many non-believers read it for comfort or simply because it is a beautiful piece of literature. What are the origins of this revered version of the Bible? What does it mean to be ‘authorized’ and ‘authorized’ by whom? Let us look into the past and see the history of this beautiful rendition of God’s Word. In the late fifteenth and early sixteenth centuries, the church in England was using a Latin translation of the Bible and their services were being conducted in Latin. English citizenry were speaking and writing more in English every day. The Protestant Reformation, sparked by the actions and beliefs of Martin Luther, urged individuals to read, and live by the teachings of, the Bible. This began to pose a significant problem in that the regular church attendees were unable to read the Bible for themselves. They increasingly had to rely on the clergy to read and interpret the Bible for them. The established clergy of the day increasingly used their ability to read the Bible to lord it over the common citizen. The citizens of England began to desire to have a Bible in English that they might read themselves. Therefore, a sequence was set into motion to give the English people a Bible in the English language. In 1526, William Tyndale published the first New Testament in English. Tyndale translated the New Testament from its original language, Greek. Myles Coverdale published the first complete Bible in English in 1535. This publication was based mostly on existing translations in German, Latin, and English, not on the original languages. The Geneva Bible, published in 1560, was the King James Version’s biggest rival. However, the Geneva Bible contained marginal notes that were not favorable to the kingship. Therefore, although the people loved the Bible, the royalty sought to dismiss or even destroy it. King James wanted to discredit the Geneva Bible. He did not like the notes it contained that questioned the idea that kings were divinely sanctioned by God. He believed that kings should be respected and obeyed unconditionally. The notes contained in the Geneva Bible concluded that tyrannical kings should not be obeyed, but possibly overthrown. In hopes of ridding the world of the Geneva Bible, King James authorized a new translation of the Bible. This is why the King James Version of the Bible is also known as The Authorized Version. This new translation would be translated from the original Hebrew (Old Testament) and Greek (New Testament). The new translation was carried out following such strict guidelines that, “…the translation now being set before the public can be thought of as representing the best possible distillation of the wisdom, grace, and beauty of existing translations, corrected where necessary against the original biblical documents in their original languages” (McGrath, p. 189). The King James was published in 1611. The simple fact that it is still one of the most popular Bibles used today attests to the fact of its accuracy. Regardless of the political climate of the times, or the moral condition of the man after whom the Bible takes its name, the translators of the King James Bible were dedicated to their task. They were much more concerned with a faithful word-for-word translation than the translators of the Bible versions before them (Tyndale, Coverdale, Geneva). Even though there have been substantial advancements made in the field of language translation, and older biblical manuscripts in the original languages have been found that were not available to the translators of the King James Bible, the variations in the texts were minor. “Not a single teaching of the Christian faith is affected by these variations, nor is any major historical aspect of the gospel narratives or early Christianity affected” (McGrath, p. 242). In other words, the King James Version of the Bible remains a trustworthy rendering of God’s Word. Many people believe the King James Bible to be a literary masterpiece. Many Christians I have met choose to memorize Bible verses from the King James rather than any other version because it is so beautifully translated. At the time the King James Bible was being translated, the English language was in the final stages of being formalized and organized. It is believed by many that this was the height of the English language. Two of the most widely identified defining influences on the formation of the English language are still said to be William Shakespeare and the King James Bible. However, “…there is no evidence that the translators of the King James Bible had any great interest in matters of literature of linguistic development” (McGrath, p. 254). The translators strove to achieve a word-for-word translation; therefore, this indicates that the beauty and grandeur we see in the King James Bible is the direct result of its Author, Almighty God. The late Henry M. Morris, who was a staunch King James supporter, had this to say about his favorite Bible translation, “…the beautiful prose of the King James is a treasure which should not be lost. It has been acclaimed widely as the greatest example of English literature ever written…It is also noteworthy that the King James was produced during the period when the English language and literature had reached their zenith of power and expressiveness” (Morris, p. 33). It is interesting to note that some of the catchphrases still in use today came straight from the original languages of the King James Bible as they were translated. Many Christians revere the King James Version of the Bible above all others. They see the beauty of its prose and poetry to be unsurpassed by any other version of the Bible, new or old. This article was written in order to satisfy my need to know the origins of this translation of God’s Word, as well as to encourage those who use the King James Bible to have confidence in its doctrinal and spiritual integrity. While we may now have a better understanding of the original languages from which it came, “…the King James Bible retains its place as a literary and religious classic, by which all others continue to be judged” (McGrath, p. 300). McGrath, Alistair. In the Beginning: The Story of the King James Bible and How It Changed a Nation, a Language, and a Culture. Doubleday, 2001. Good article Robert. Very interesting and many things here that I learned (what times do I not learn from you though!?). I had not realized that all of these sayings had came from the King James Bible. Again, superb work and you show your knowledge of the Bible and biblical history is replete with much. Thank you and I thank God for you Robert. I learned a lot while doing the research for this article. My own ignorance of the King James Bible is what inspired me to write this article. Very interesting and it strengthened my confidence in the KJV. Although, there are other versions just as reliable, also. I believe the KJV is unlike any other bible version and that much of the reason behind that is lost to probably most Christians today. Our market is flooded with “other versions”. Only the KJV is not bound by copyright and God said his word would not be bound II Tim. 2:9. Its perfectly accurate and you can copy and distribute without asking anyone for permission as no one owns it. You can’t say that about any copyrighted bible though which contain “parts” of God’s preserved word, changes other parts and is owned by men. As I included in my article, none of the alterations contained within the reputable translations affect any essential doctrine. So, as long as one relies on the most literal translations and not on a liberal paraphrase, there are other versions just as good as the King James. But, on the other hand, if the old KJV English is not a problem, there is no reason to NOT use the KJV. I tend to look at several different versions when I am doing Bible study, because many Greek and Hebrew words cannot be fully translated by a single English word or phrase. God bless you in your Christian walk. I prefer the KJV of the Bible over all the other versions. Thank you for reading and commenting. The KJV is a fine version of the Bible. If it weren’t, it wouldn’t have enjoyed the popularity among Bible-believing Christians that it has had. It is faithful to the original languages and is really quite beautiful and elegant (yes, guys can say that kind of thing, too…ha…ha). God bless you. I really enjoyed this article! It appears that I agree with those who’ve posted before me, that the KJV is the gold standard. Like Mr. Driskell, I too like to read the same verse in several different bibles to get a broader vision of what is being said. Though, about half the time the “broader vision”, was what was written in the KJV in the first place. Another reason I am glad this article was written, is that as a Christian, when someone asks who wrote the bible, or how do you know that what was written is accurate, I will now be able to answer with confidence and detail. Thank you for reading and commenting. I am very glad that the article has encouraged you and emboldened you in your Christian walk. I actually wrote it because I was curious to know the details concerning the origin of the KJV. What I found reinforced my belief that our Great Lord is fully capable of circumventing the failings of man in order to present His Word in the form and fashion that He wants it. The only time I have trouble with the KJV is when I have to look up an Old English word I read in it. But that doesn’t happen often. God bless you. Another really good article and very interesting. Your comments mean a lot to me. A whole lot. I learned a lot myself while doing research for this article. It impressed on me once again that God works for the good of those who love him in every situation. He took a politically charged circumstance and used it to further His Word. God bless you Allan. My greatest joy in life is being used by God for His purposes. It’s hard to believe that, when I was lost, I thought that being a Christian would be a miserable existence. It is the greatest life a person can live. God bless you. The King James Bible is indeed a beautiful version of the Bible and has inspired, informed, encouraged, and been a blessing to many through the years, and continues to do so today. However, it too is a translation from the original languages (Greek, Hebrew, a bit of Aramaic) and is subject to the limitations inherent in the translation process. There are other translations that are as accurate as the KJV. Many of the other versions simply elaborate on the meaning of some words because some Greek and/or Hebrew words have no exact equivalent in English and must be explained a bit. The Christian should pray for guidance, and then use the version of the Bible that he or she best understands. Keep in mind that the closer to word-for-word a translation is, the better. God bless you Evelyn. I believe the KJV. I have a hard time believing that a new version with a copyright is the ‘final authority” of God’s word. Also the so called “older manuscripts” not available to the KJ translators is open to debate. I have a photocopy of a Geneva Bible as well as a Webster’s Bible (yes the dictionary guy) who updated the old English to modern language of the time. Webster’s never caught on to become popular. I believe and trust the King James Bible – every word. Thank you for reading and commenting. I’m not sure what copyrighting has to do with whether or not a translation is good or bad, but I will say this: I am happy hearing that a person is reading the Bible, regardless of the translation. Too many humans never pick it up, some who read it don’t follow it, and some don’t believe it’s worth picking up. I feel sorry for those people. The Bible is God’s Word, He wants us to read it, understand it and live by it. It contains words of life and reveals God’s heart to us. God bless you Chaplain Bob, may the Word continue to bless you. I really enjoyed reading Mr. Driskell’s article after finding the web site searching for the best bible translation and found Mr. Wellman’s article. I submitted that NIV is a copyrighted work, therefore it has to be substantially different from other bibles in order for it to be considered a different work. By definition it should then be precluded from being called a “translation” as it substantially different from KJV. I think that is the point Chaplain Bob was making regarding copyrighted work being the final authority. Thanks for reading and commenting. I pray God richly blesses you in His service. First, a copyright is not a bad thing. It simply protects one’s work from unscrupulous people who might claim it as theirs. It also protects the work from being manipulated or altered after its publication. A copyright does not make anything better or worse, it is simply legal protection. I am not sure I understand why you would not consider the NIV a ‘translation’ simply because it is different from the KJV. Both were translated from the original languages of Hebrew and Greek. I know it’s sometimes difficult to understand clearly in emails, comments, etc. (especially for me, it seems), so I’m just asking for a bit of clarification, if you would. Once again, I thank you for reading and welcome you back anytime. God bless you. Your reply almost slipped my attention, since I had been watching Bro. Wellman’s article on which Bible translation. Thank you for your well wishes in my Christian service. “I submitted that NIV is a copyrighted work, therefore it has to be substantially different from other bibles in order for it to be considered a different work”. This was reference to something I submitted to Bro. Wellman’s comments that NIV is copyrighted, whereas KJV is not. The point I was making is that in order for the NIV to be considered copyright-able by law it needs to be substantially different for it to be considered a new work. NIV is very different in that respect. On that basis I do not consider NIV to be a translation per se, because it has made so many “dynamic equivalent” replacements, and removed entire verses, that it changed the context of what was being said. Another example is NIV 2011 where they have introduced gender neutral language, which confuses the reader as to even who is being referred to or who is present when the statement was made. Agreed, copyrighting is something modern translators do to protect their work. I was simply making the point that KJV is not copyrighted, and that’s just fine with me. The KJV continues to be my constant source of blessings. Thanks for getting back to me. I must say that I agree with you about the NIV (although I don’t want to get into a lengthy debate about which translation is best). The NIV just hasn’t been my favorite version. I like one that is closer to a word-for-word. 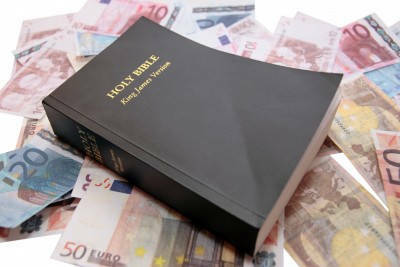 The NIV does happen to be the most popular version according to sales today. However, popularity should never be the guidelines by which we make spiritual choices. About the KJV, I hadn’t really used it that much, due to the (perceived) difficulty in understanding old English. Nevertheless, while writing this article, I became reacquainted with it and have been using is quite often since. It is an accurate translation and a beautifully written version. Thank you for your response Michael. Have a blessed New Year. Good article sir. where can I get the original “1611” KJV? My uncle recently gave me a Bible called the Companion Bible. It contains the text of the 1611 version and extensive study helps (mostly language clarifications) by E.W. Bullinger. Now, I do not know Bullinger’s theological stances, so bear that in mind. The language helps are really very good though. The other thing you could do is to ask someone at a Christian book store. The 1611 version may be more available than we think. Whichever version you use, keep studying His Word, it is the light upon your path. For those who are asking, Hendrickson Bibles publish a word for word facsimile of the original 1611 Version, with original notes. It even has the old spelling, however the print is not the old Gothic style. ISBN 9781565631625 I got one it has the original margins notes etc. I think it was published as part of the 400th anniversary of the KJV. Like always you can get them on Amazon or similar. Robert I believe that the KJV language was very carefully selected to be poetic and written with a rhythm. It was thus written so as to make it easily memorable and that was the main reason. Bibles were too expensive for most people to own one and therefore it was important for people to easily memorize what they heard from the priest on Sunday. While the KJV is beautiful sounding and a great literary work, I find it astounding howeve,r that some people some obviously commenting here seem to think that the KJV is somehow the only correct, or most correct translation of the Bible. Clearly much has been learned about ancient language translation and there have been archeological finds since 1611. Further I find it truly incredible that some devout kjv followers go to the extent of calling all modern day translations heretic or under the influence of Satan. There is no special process that sets the KJV accuracy above any other word for word translation of the Bible. Given the reason for the translation of the KJV on the direction of Prince James, it is also good to question if the translators did not have some slight pressure on them in relation monarchical related scriptures. Similarly modern day Bibles seems to have pressure put on them in relation to gender neutrality. I think you make a very good point that regardless of whether you read the KJV, New Jerusalem, ESV, DD, NKJV, NRSV, RSV you will still get the same gospel, there is not a difference in doctrine between only a change in language. While the language in the KJV is very beautiful it is found by many very difficult to read and modern day versions help more people to read the Bible than if only the KJV were available. I know my Mother for example has never read the Bible all the way through and does not read it, despite attending church every week. I believe this is because her church tells her that the KJV is the only bible to be read and she finds it too difficult as she does not read well. I have had several discussions, within an article by Jack Wellman on predestination versus freewill, about the subject of the King James Bible. I do not wish to repeat or belabor the point, as anyone can go and read it for themselves. I just want to give you some information on copyright laws that you may not be aware of. In order to obtain a copyright, a literary work must be noticeably different from any other, and you must state that you are the ORIGINAL author of the work. I am sorry, but I have to question the integrity of anyone who claims to be the original author of the Holy Scriptures. I also already question the integrity of our government, so the fact that they validate the deceitfulness of such a claim by giving them a copyright, verifies for me that the even our immoral government does not believe these “newer translations” to be the same as the Holy Scriptures of God. The only reason a government that is so against God has for allowing deceit to be publicized, is to keep the public confused and at odds with one another. It reminds me of how God used differing languages to confound the men who were building the Tower of Babel. They could no longer work together and be of one mind. Just look at the divisions and denominations of men, and understand that the author of confusion is alive and well in our midst. Our country itself is falling to pieces because we no longer operate in agreement and of one accord in our efforts to follow the God of Heaven. Our founding Fathers did and built a great America. They based their belief and practice on the King James Bible for centuries as this country was built and established. Tell me just what the “better” translations have accomplished, while men spend more time and effort into deciding which “version” of scripture is best, instead of truly studying to understand and obey God? Scriptures teach that God himself would preserve His Word for His people. He accomplished that for English speaking people through the King James Bible. Who are these men that have decided God’s Word is not good enough and needed their opinions, changes, and better translation, to accomplish God’s purposes? I haven’t heard of the need for a newer, better Koran, Torah, or any other supposedly sacred document. Why do you think that is? Because Satan only needs to confuse the followers of Christ in order to accomplish his purposes. And don’t we love to be deceived? To God be the glory for any truth I may proclaim, and please forgive any mistakes as all my own. Excellent points and well spoken. I believe you sum up the Bible version issue quite well. Jesus, who is Christ, clearly says he is the “MORNING STAR”. Read it again if need be until you get it and it is clear. So what about the morning star in Isaiah? The Morning Star (Jesus?) fell from heaven….? what? King James Version says “Lucifer” fell from heaven. Ask any Luciferian occultist who is Lucifer and they know it is the Devil and Satan. I feel you have a much better grasp of the Bible versions issue over and above many with the title Dr before their name. Thanks for comment. You have pointed out some issues you see with these passages concerning “Lucifer” “Morning Star” etc. However, when one looks at the context surrounding these passages (always a good thing to do), it is clear that these two passages are not talking about the same person. Only someone who wishes to be decieved would ever confuse the two. Not only that, but the original Hebrew and Greek (Isaiah and Revelation respectively) can be translated in many other ways (and have been) “son of dawn” “son of daybreak” “star of morning”. It is my opinion that this translation debate is taking our eyes and resources off of what truly matters; the salvation of a lost and hurting world for God’s glory. We are majoring on minor things when we should be focused elsewhere. Every English Bible is a translation from the Hebrew and Greek, the word-for-word translations are the best, but sometimes going word-for-word from one language to the next results in gobbledegook; therefore, we must make the words understandable to the readers. I believe that God is powerful enough to take even mistranslated words and use them to His glory…no matter what translation they came from. To Him be the glory. God bless you, Chaplain Bob. Thank-you Chaplain Bob for your kind words. I do not want to be deceived, but I have little confidence in my own thoughts and ideas. Any grasp I may seem to have is only by God’s grace. He has been abundantly merciful to me a sinner. To Him be the glory! Thanks for reading and commenting. I too do not want to get into a lengthy debate about the virtues of Bible translations. Therefore, I just have a few thoughts on this to add. I do not think the publishers of various Bible translations are claiming that they “wrote the Bible”, only that the translation is their work. The newer translations merely attempt to keep up with our ever changing English language. I agree with you completely, God will preserve His Word, no matter what language it is in. If only the King James were allowed (as some seem to believe should be the case) how would those who speak (and read) a language other than English be able to read His word? I believer, as I hope you do also, that reading the Bible from any reliable version is better than not reading it at all. Is anyone advocating people should stop reading the BIble unless it is from the King James Version? The KJV is a fine translation, but it is a translation. God did not speak to the Prophets and the Apostles in English, therefore the KJV had to be translated just as the newer version have been. I certainly do not want to discourage anyone who is reading the Bible. Sometimes this debate about versions has that effect. God will use His Word, from whatever translation, to touch the hearts and lives of those who love Him. To God be the glory. I think you may have missed my comment that the King James is to English speaking (and reading) people. I have never suggested it is the be all for other languages. However, based on my experience, I do believe the English and America in particular would be better off, if we only had one set of Holy Scriptures, like the other “religions” of the world. They do not seem torn apart with differing ideas of what “thus sayeth their god,” and as we are seeing, they are accomplishing much destruction in their unified vision. Whether all Muslims practice Jihad or not, just say a word against their god and watch the uprising that will take place in the name of Allah. Try to elect a God-fearing Mormon over a Muslim, and do all Christians support Him? No way. Look where the divisions in Christendom have got us? The Obamanation? Removal of God, prayer, the ten commandments, the definition of marriage and family? Why didn’t the pioneers have these issues? They had one bible, one view of God, one set of laws and commandments to follow. As scripture itself states, there is no private interpretation to scripture. It was never designed for men to change it as the culture changed. Then we become, “and every man did that which was right in his own eyes.” Doesn’t that pretty much sum up our country and our culture? I recently moved from a large farm in the country to a big city. I am finding that even those that call themselves Christian, look and act like the world, completely contrary to God’s instructions. I see a people who call themselves by God’s name, but demand to wear their own apparel and worship their own gods and they all use another “version” of the bible as their standard of living. I am just not seeing the positives that so many are claiming. Again, who dares to think they can improve upon God’s Word? God bless you as well, Robert. Thanks for the comment. The problem with our nation in general, and some Christians, is not their choice of Bible translations, but the fact that they do not submit their wills to the will of God. It wouldn’t matter what version of the Scripture they read, their hearts are still in rebellion against God, therefore, they accept many of the ways and morals of the world. Once again, I am glad that people are reading the Bible, no matter the version, I just pray more people will live it in their lives. God bless you, Anne. Keep the faith. There is a world out there to win to the Lord. Let’s get down to business! Have appreciated your position on different translations. Thank you very much for reading and commenting. Your insightful comments are very much appreciated. I agree wholeheartedly with your zeal to spread the Gospel…regardless of which version of the Scriptures we use. May God continue to bless and guide you. Al Jackson, you are spot with your comment.. I do the opposite though with the two versions I use most. At church we use the KJV(although I use a 1967 New Scofield KJV) but use almost exclusively the NASB for personal study. I believe the NASB to be THEE most accurate version in English since English has become a language. It’s herky jerky in fact being soooo word for word that it’s a bit cumbersome to just read straight out. The KJV would be better for that. But for serious study, the NASB is the BIBLE…IMO(in my opinion).. Thanks also Robert for your excellent insights into this topic. You hit the nail on the head nearly perfectly with every post and reply. Lord Bless! I agree Mr. Bowers. The NASB is the best I have found. I have a copy of the 1901 ASV Bible also (which we know the NASB comes from) and find it extremely accurate. Although no translation of the Bible is perfect(nor Inspired) as only the Original Autographs can claim that, I find these two translations along with the KJV to be about the best in the English language. Thank you Mr. Bowers. I discovered (as you probably already know) that the NASB does a superb job in translating the Hebrew, Greek, and bit of Aramaic. I love it. One example is where the New Testament uses “servant” in the KJV and most others but it is actually “doulos” which means “slave.” That is a huge difference, isn’t it? Yes, I’ve noticed in my studies the more accurate rendering of certain words as they are translated in the NASB Bible. I suppose however slave back then was more what we think of as a servant these days. Possibly by 1611, the King James translators were already thinking along those lines when referring to slaves, as in certain peoples that were treated harshly or very wrong(like this country did in the 1700/1800’s) wasn’t what slaves meant back in Jesus’ time so they used servant to give the sense of what slaves did meant in His time, not what it means in our time these days. I think either word though works for us to get the meaning of what God was trying to convey to us. But I really like it that the NASB has it the way it truly means. You wrote this below in your post above..
That is an incorrect statement about the KJV. The FACT is the founding father used the GENEVA BIBLE(probably either the 1560 or 1599 version) which guided them in the foundation of America, not the KJV. Eventually the KJV made it over here to America and common folks began using it also as well as the KJV. Sorry, my last sentence should have ended with “began using it also as well as the GENEVA..